When it comes to making flower arrangements, it's always much more fun to make them with flowers you have grown yourself. Whether you are making an arrangement to liven up your living space or to give to someone else, using your own flowers will make the arrangement that much more special, causing people to ask: “are those from your garden?” There are a number of excellent plant choices for use as cut flowers: perennials and annuals both make for great cut flowers and also will grow easily in your garden. Here are a few suggestions of great flowers you can grow yourself that will also result in a lush, one-of-a-kind bouquet. They make great Valentines Day flowers when you want to express love to your partner, but that is not the only thing they are useful for. Roses are really easy to grow and will produce beautiful blossoms year after year as well as add a lot of elegance to an arrangement. Roses also come in a variety of soft and beautiful colours. These flowers are everyone's favourite cut flowers mainly because they bloom profusely and come in a variety of colours. 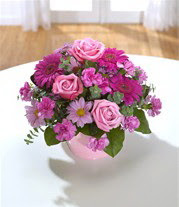 The more you pick them, the more they grow, which makes them ideal to use in an arrangement. The delicate flowers and wispy leaves do a lot to accent your bouquet. These tall, gangly plants explode in spidery blossoms of pink, purple and white. The vivid colours and the unique shape of the flowers add a lot of texture and intrigue to both your garden and your arrangement. These popular garden plants also make a great addition to an arrangement given their rare true blue colour and lasting blooms. Forget-me-nots grow in tight vivid clusters, which will help you achieve a variety of shapes and sizes in your bouquet. Marigolds produce amazing, brightly coloured flowers that are strong enough to help prop up other flowers in your bouquet. Their texture will give your arrangement a very soft and touchable look and come in great spring shades from soft yellow to deep gold. Whether you choose the short or the giant variety, sunflowers of all sizes make great long-lasting cut flowers. As the focal point of a bouquet, these bright and cheerful blossoms will bring the fresh feeling of spring to your home. Nothing grows faster and with as much vigour in your garden than the sweet pea. Although the fruit they bear is often the prize of growing them, the blossoms they produce also make great filler in a spring bouquet. The stems are deceptively strong adding structure to your arrangement, and the flowers offer a variety of colour and spicy scents. Baby's breath is a favourite of many gardeners for adding texture and a light feeling to their flowerbed. In an arrangement, the airy sprays of white and pink flowers add a burst of freshness and variety and create a sense of lightness, delicacy and softness. Black-eyed Susans are a staple of any flower garden. The traditional golden daisy-like petals burst out of both gardens and flower arrangements like the sun; they are easy to grow, and their long, straight stalks add dimension to your arrangement.